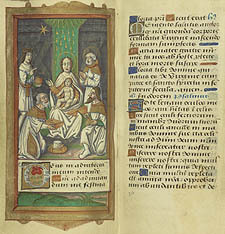 The Adoration of the Magi: the wise men from the East worship the infant Savior. The Epiphany narrative was recalled at the canonical hour of Sext (hora sexta), that is, the "sixth" hour after sunrise, or about noon. Gift of Mrs. Pauline M. Rubens. Book of Hours. France, ca. 1500.